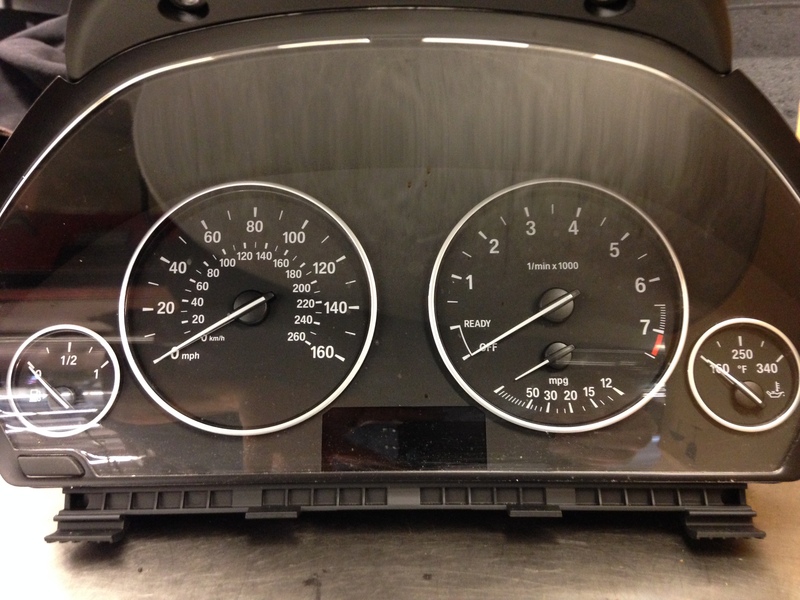 Yea a beautiful instrument cluster,,,,big deal right,,,,it is when we are finding out that some of these instrument cluster are causing problems,,,,,this one came out of a F30,,,,the customer complained about battery warning light come on the I-drive when the car is off. What we are finding out that there is wake up line that keeps waking up when the car falls asleep,,,,we are finding this fault Driver KL15 WUP,,,,which is KL 15 wake up line,,,,there are many wake up lines on this vehicle,,,,but we found out the wake up line from the instrument cluster is not shutting down,,,,,we have noticed this on several different vehicles like the F10,,,,it looks like we are having problems with instrument cluster right now. This entry was posted in Uncategorized and tagged battery warning, cluster, instrument, wake up call. Bookmark the permalink. When I first got my 2014 320i, with less than 5,000 miles, the clock would not keep time. It was the strangest thing. Hours would pass, however, the clock would only advance a few minutes. It turns out a replacement cluster resolved the issue. With the clock presumably all in software, I still cannot figure out how exactly something like that could fail. Hello, hope your OK. 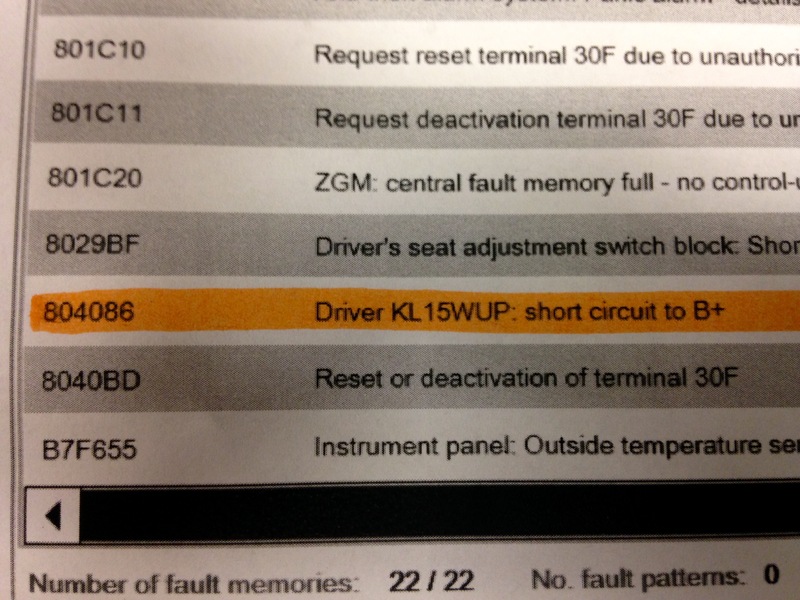 I get an Increased Battery Discharge when stationary fault message on our 320i (F30), it happens if the car isn’t driven between 1 and 2 days, what are the common causes and fixes to resolve it. I think something must be waking the car from sleep and causing the drain, many thanks. Thanks for the reply, I have seen a fault: Integrated Automatic Heating / Air conditioning – Blower output reduction due to power management, does this indicate the interior fan blower is faulty and could be causing the battery fault? Have you experienced any issues with the fans? I am thinking of getting an Oscilloscope test to check voltage drops over a long duration as the fault doesn’t happen straight away. I’m curious after reading this topic as if this could be similar issue with the Wife X1 2015. The vehicle in winter would go into limp mode due to the vehicle waking up many times and then not enough battery power to be charge up due to short commutes. However the dealership ended up saying it was due to a car starter. Very odd when my honda never had this issue, and we did over 140km drive one way and the vehicle remains in limp mode for the return trip. Hello. I’d been having an issue for a few days with error msgs ranging from transmission failure, bonnet open and none of the instrument cluster working on my 2013 320d BMW. These issues would all be there in the morning and then all clear after driving for about 15mins on day 1, about half hour day 2, and an hour on day 3, but then this evening, the car started with the faults, drove as normal for half hour and then cut out and has not restarted since. I suspected a dodgy battery / alternator but the breakdown guy said they’re fine. His code reader has threw up CAN, serial BUS and various other network related things but there is something there about the battery as well. The car has been with an auto-electrician since and he has today diagnosed the KOMBI was failing and has now dragged down the whole MOST. He has tried updating the software and checked everything else before regrettably coming to the conclusion that the KOMBI needs replacing. Yes it’s possible the kombi is causing the problem,,,,I know it’s expensive and it still might not fix the problem. I’m an electrical engineer in a steel works and my experience with network faults is that we normally keep changing units until we get to the right one!! 🤦🏼‍♂️ Embarrassing? Yes! Expensive? No! Because it’s Tata Steels money not our own!! Is there a way he could’ve tested the KOMBI to prove it to be faulty or do you think he may just be making an educated guess?! I would have to see what CAN and BUS faults are displayed,,,,sometimes this is a guessing game I hate to say. when i lock car something discharcing battery we discover when we put out fuse of instrument cluster than nothing discharning battery.